Its been 2 years since the plan to build a bike with a friend of mine started. We were driving back from my first display setup at the Halifax Bike Show and were feeling pretty excited. We decided the plan was to find and build a old school project bike. He would help build and eventually I would be in charge of painting. 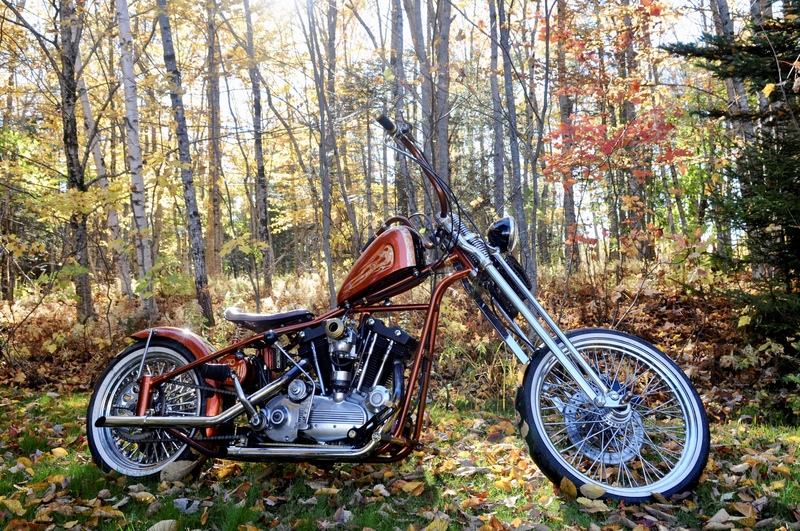 Shortly after we found a 1974 Ironhead motor with a very cool frame on kijiji in the Toronto area. After a little discussion a friend went out and purchased the parts. Our project had a starting point. It wasn’t till we saw the parts that we realized that what we bought was not close to a complete motor. The parts were stacked together to make it look like it was all there. The frame was very cool and after a lot of research with very little success i found a clipping from an old Easy Rider Magazine. From what i could see the frame was a Goose Neck Plunger frame from The Machine Shop and it was very cool. The search began for a new motor/bike and hopefully one that had New Brunswick registration as it would make the new registration easier. Shortly after we found a 1970 Ironhead and as luck would have it was registered and other than minor issues had a running motor. Most of the bike was stripped and we were ready to move on when my builder/buddy was involved in a serious bike accident and it was not good. By fall he had not improved much and i decided to move forward and dropped the bike off at Seans Non Stock Customs in Halifax. He had it for a few months and when i picked it up in March when i went back to the Halifax Bike Show i picked up a really cool roller. I had to go see Chopper Rods for a few minutes and we got in the conversation of my bike and before long we had made an arrangement and he would get my bike fully built and working. Unfortunately it was a rainy day project so it took a bit longer than anticipated but his team did a spectacular job with the build. They had the same passion in building bikes and they did not just slap it together. It was a lot of work and they really made the bike come together with brass pieces for look and functionality. The build included modification from drum to disc brakes that involved a lot of fine tuning. The frame is 3 inches longer in front and rear so there was a lot of extra effort/thinking to make it work. We also ended up turning the plunger suspension into a rigid. The little that I did find, it was very dangerous as the rear wheel could twist in a turn causing potential issues. I was back and forth checking on status and before i knew it the bike was ready for paint. They stripped all the parts and i brought them home for the paint. It was finally the point i had been waiting so long for, my turn. By this point i had an idea of what i was going to paint and had a test panel on colours that i was happy with. I started from point zero and had to sand and high build all the parts. They were all raw metal and although no damage, the frame had a lot of rough areas from weld. I had a vision in my head but the paint changed a bit as i moved deeper in the project. I had picked up Roth Flakes at SEMA but the rest of the paint was House of Kolor. The flake took a lot of clear to bury and wit the layers of varigated leaf, pinstriping and Tangerine Kandy, there was a lot of time invested. Laying down first layers – House of Kolor Tangerine Kandy and without FBS tape this would have been a nightmare. While paint was drying i also took time to clean up the motor. I spent a long day cleaning and polishing the motor. It was amazing how much it cleaned up. Ride on! Fredericton, New Brunswick, Canada Lovin Life! So the bike is together and running, I have had it out a few times and it is working good. It has been a long 2 years and a lot invested. Seeing the bike and riding it makes it all worth while and although it is a town and show bike it sure is fun to ride. There are a few tweaks I have to do but overall it was a successful build. The bike is getting a lot of compliments and showcases my paint capability. It is a Harley so it will leak oil but with minimal effort this 1970 should ride for a few more years. Lovin Life!! !